That was the rallying cry last night in Kensington, a multiethnic, largely immigrant neighborhood in central Brooklyn. On the heels of President Trump’s executive orders cracking down on illegal immigration, residents of Kensington and elsewhere in Brooklyn gathered to announce the launch of a “Hate Free Zone” and community defense network. The rally was organized by Desis Rising Up and Moving (DRUM), a grassroots community organization of working-class South Asians in Brooklyn and Queens (“desi,” from Hindi, means a South Asian expatriate). Residents of Kensington hope the Hate Free Zone will create a robust grassroots network that can respond to any threats against vulnerable members of the community. “While our communities have been facing violence and oppression for years, we are now in a critical moment in history,” said Israt Audry, a member of DRUM and an undocumented immigrant who has lived in the United States with her family for the past 16 years. Having immigrated as a minor, Audry is one of the nearly 800,000 young people who have benefited from the Obama administration’s Deferred Action for Childhood Arrivals policy (DACA). The policy allowed Audry to work legally in this country and thus guaranteed her the right to earn at least the minimum wage, making her the breadwinner for her family. DACA may soon be on President Trump’s chopping block. “By declaring this community a Hate Free Zone, we are committing to the practice of building a community defense system that will defend our communities from workplace raids, deportations, mass criminalization, violence, and systemic violations of our rights and dignity,” Audry told the crowd. 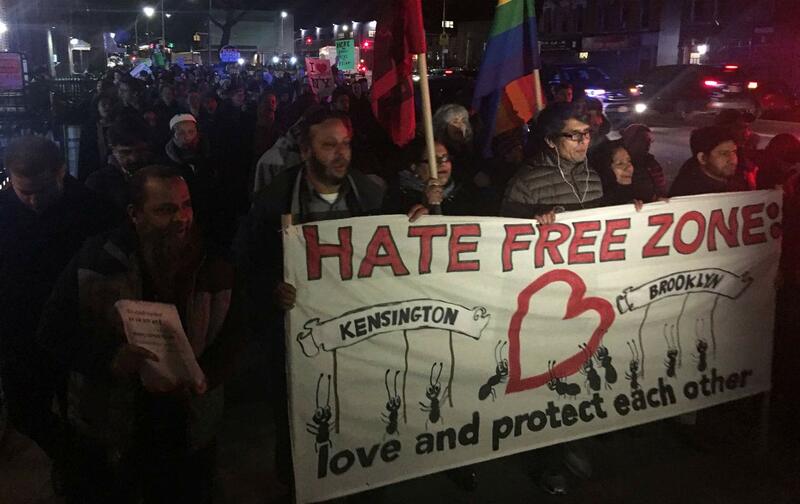 Even with a larger emergency rally of several thousand in Manhattan’s Washington Square Park happening at the same time, the Kensington Hate Free Zone launch drew a crowd of nearly 400 people. Many in the crowd were South Asian residents of the neighborhood, while others came from across Brooklyn to support the initiative. South Asians are the largest immigrant group in Kensington, according to the latest Census figures, and the rally took place in a part of Kensington sometimes known as Little Bangladesh. In addition to signs supporting immigrants and immigrant rights, demonstrators had signs supporting Black Lives Matter and opposing homophobia. Organizers made a point of emphasizing that the Hate Free Zone is a stand against all forms of bigotry. Cars, trucks, and one MTA bus driving by honked in support at the busy intersection where the rally was held, a South Asian grocer on one corner and a mosque on the other. The president is expected to sign more executive orders today, among them one halting immigration from certain Muslim-majority countries. His campaign trail call for a registry of Muslims could also be advanced in the coming days. Critics warn that in addition to separating families and hindering economic opportunity for immigrants, Trump’s actions could lead to an increase in anti-immigrant and anti-Muslim hate crimes. For that reason, many attendees last night feel that the Hate Free Zone’s community defense is necessary, to protect them both from federal agencies as well as from individual acts of violence and harassment. According to a report released two weeks ago by the New York City Comptroller’s office, there are 3.3 million immigrants in the city—40 percent of the city’s population. Those immigrants contribute $8 billion in city and state income tax every year. They are also job creators, owning 51 percent of all of the city’s businesses. One speaker at the rally, Sohel Mahmud, a construction worker who immigrated from Bangladesh in August 2015, drew attention to the fact that business owners in the city depend on immigrant labor. Immigrants comprise 46 percent of the city’s workforce, per the comptroller’s report. Construction is one of the most heavily dependent on the labor of immigrants, with 64 percent of workers born outside the United States. Elected officials representing Kensington at the city and state level also spoke at the rally. Brad Lander, the city councilman who represents Kensington, began with a call and response of the inscription on the Statue Of Liberty: “Give me your tired, your poor, your huddled masses yearning to breathe free.” He then went on to criticize what he called the “vile xenophobia” emanating from Washington. One particular consequence of Trump’s executive actions yesterday is the president’s plan to pull federal funding from “sanctuary cities,” cities such as New York that in a variety of ways offer safe harbor for illegal immigrants. Though some legal experts are questioning if Trump has the power to do so, if Trump cuts federal funding to New York, it could cost the city $7 billion. Robert Carroll, the newly elected assemblyman from Kensington, specifically criticized the federal government for attempting to “blackmail” the city into accepting its immigration policies. Speaking to The Nation after his speech, Carroll said that he hopes other sanctuary cities like Austin, Los Angeles, and Seattle can band together to resist Trump’s plans to cripple their budgets. Nonetheless, organizers are bracing themselves for the possibility that the city goes back on its promise of being a sanctuary city. The rally ended with a march through Little Bangladesh, where local business owners joined in on chants declaring their neighborhood a Hate Free Zone. Going forward, DRUM will start coordinating activities in the Hate Free Zone, from self-defense and bystander intervention training to creating a rapid response plan to raids. The group is also thinking about how to leverage institutional power. Fahd Ahmed, DRUM’s executive director, says that he hopes they can eventually influence Washington or other national institutions. But for now, organizers are going to keep building and strengthening the Hate Free Zone, in preparation for the day when the Trump administration does finally challenge them. Jay CassanoJay Cassano is a freelance journalist whose reporting focuses on inequality, technology, and the Middle East. He currently lives in Brooklyn and previously worked as a foreign correspondent in Istanbul.